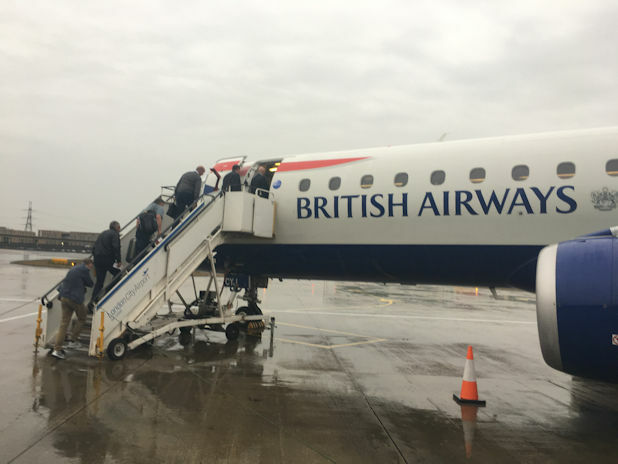 On 18 May 2017 BA CityFlyer launched flights from London City Airport to Manchester. There's only one flight a week on a Thursday from London and two flights returning from Manchester on the Sunday. This is in contrast to the eight daily flights between Heathrow and Manchester. The London City flights are actually positioning flights as BA CityFlyer are operating weekend flights from regional airports such a Manchester and Birmingham to popular holiday destinations over the weekend when there's fewer flights from the business oriented City Airport. As the plane needs to position in Manchester along with the crews operating the aircraft in passenger service made sense even if the flight isn't always busy. The main reason there's so many Manchester-Heathrow flights a day is to feed connections to long haul flights. With a journey time on the train of around 2 hours, it's hard to beat the city centre - city centre journey time of the train which is why there hasn't been a regular London City to Manchester service since 2009. Despite the limited frequency, this route may still appeal to some, particularly the Sunday evening flight back to London for those who live in Manchester and work during the week in London. I took the Jubilee line from London Bridge station to Canning Town where I changed for the DLR to London City Airport. The change of trains involves going up an escalator at Canning Town and is a fairly simple interchange. The total journey time was around 20 minutes and I arrived just after 7pm. The only drawback is that the tube is still very busy at this time of day so you're likely to be standing. As I had no luggage to check-in, I had already downloaded my boarding pass in the British Airways app and could walk straight to security. For those who needed to check in a bag, there are self service machines where a boarding pass and baggage labels can be printed before dropping off the luggage. Security wasn't too busy so was through in under five minutes. There's no dedicated Fast Track (as City Airport has a lot of frequent travellers the benefit of a Fast Track will be limited as most passengers would qualify for it). There's no lounge airside at London City Airport (there is a lounge landside, but not available to BA passengers, I don't think it's really needed at this airport) as the airport is intended for not spending too much time. You can turn up at the airport with less than 30 minutes before your departure and still make your flight. The airport is much smaller than the other London airports although it has expanded rapidly in the last 15 years. There's a number of bars and places to sit. I remember on Friday's there was sometimes difficulty finding a seat but there was no such problems on a Thursday although it is still quite busy. Boarding was announced at 30 minutes before departure. As is usual for City Airport you board the aircraft via steps there was a bit of rain today but boarding was quick. The flight was an Embrarer E190 which is the larger of the two types operated by BA CityFlyer. The seating is 2-2 throughout and has better than average legroom in all seats and particularly good legroom in bulkhead rows. I was in seat 1A, the first row on the aircraft. 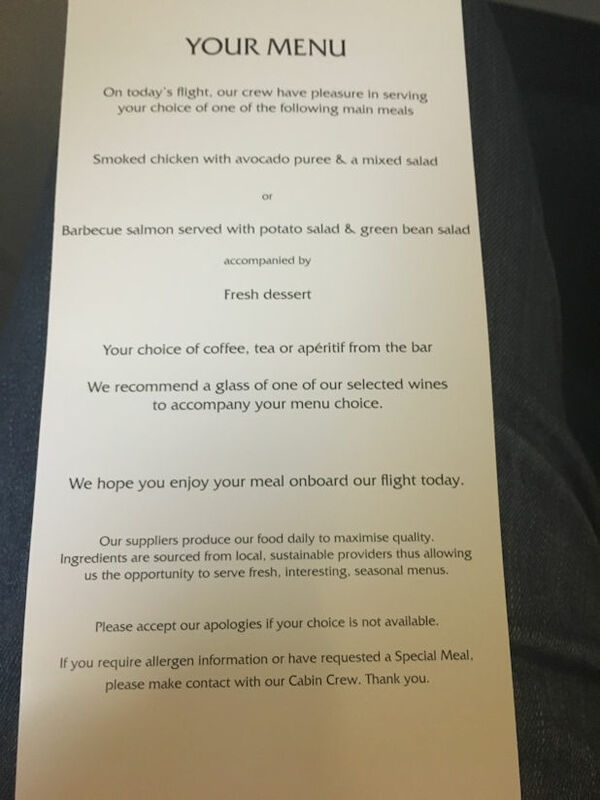 Service was good with a friendly crew and menus were handed out before takeoff. 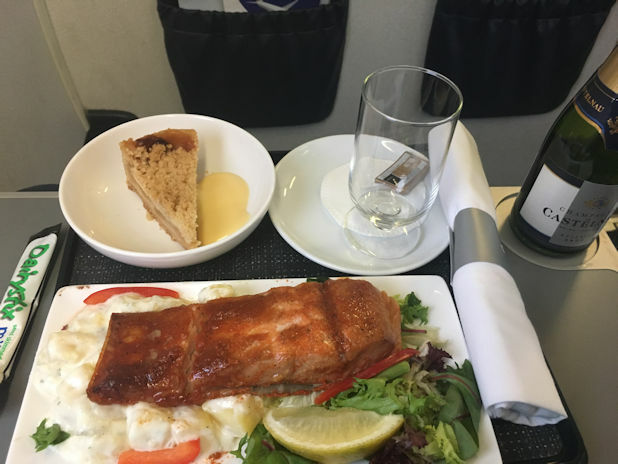 As the time in the air is around 40 minutes the flight has a choice of two cold meals, in this case it was a choice of a salmon or a chicken salad. After take off the meals were served. There were only four passengers in Club Europe and a total of 36 on the plane. A full complimentary bar service was provided, including champagne, and despite the short flight everyone was offered a second drink. Service was attentive with the trays cleared away when finished. A nice touch was warm bread was provided with the meal and the butter just melted into the bread. Landing at Manchester was trouble free and the aircraft was attached to an air bridge so it was straight into the terminal. I had no baggage to collect so it was straight to the Manchester Airport Hilton where I'm staying for the night (paid for on points of course). The limited schedule on the London City to Manchester route will mean it'll only be of use to some people, but if the schedule works for you then give it a go. The fare was £100.80 return in economy and £237.80 return in business class and this was booked two days in advance. To compare with Virgin Trains two days in advance at similar times the fare worked out at £120 in standard class and £252 in first class. The train will be cheaper if you can book further ahead but it's also worth remembering the on-board service on Virgin Trains is limited on a weekend, so returning on Sunday you will get better service in Club Europe on the plane. Although it is debatable I would say the catering on the plane was better than Virgin Trains for a similar timed departure. When I last travelled to Manchester I took a train after 7pm and only sandwiches were available. Also due to the smaller size of the Club Europe cabin compared to First Class on the train it means you get a more attentive service so despite the plane being only 40 minutes in the air you will get both well fed and plenty to drink. It's possible to book this ticket using Avios, the rewards currency used by British Airways. There is a fixed fee of £25 each way to cover taxes and airport charges. The total cost for this flight would have been 7750 Avios + £25, this would rise to 9000 Avios if the date was classed as a peak date. Avios tickets can be booked right up to a few hours before departure if there's availability. As I booked a revenue ticket I have earned 1250 Avios (for rewards) and 40 Tier Points (for status) for the outward leg and will earn the same on the return. A domestic flight earns 500 base Avios, you also get 250 extra Avios for travelling business class and as a Gold member I earn an additional 500 Avios on top of that. Like other short distance Club Europe flights this would earn 40 Tier Points. This goes towards your status level (blue, bronze, silver, gold) which determines what loyalty benefits you receive. Articles in the 'blog' section contain the opinions of the individual contributor and may not reflect the views of the campaign as a whole.